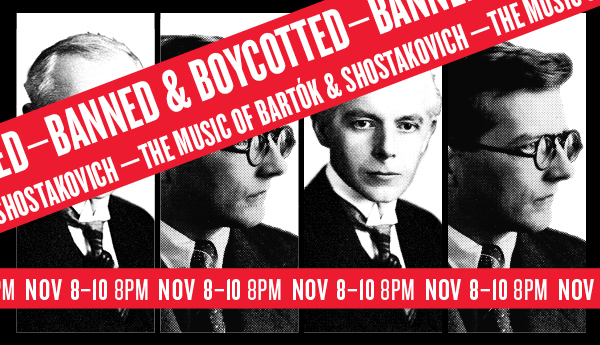 Few rival Bartók and Shostakovich in writing works both socially resonant and disruptive. Despite roots in the folk music tradition, Bartók’s beguiling ballet score, The Miraculous Mandarin, faced censorship in the composer’s home country during his lifetime. The lurid tale of prostitution, theft, fraud, and murder was deemed too depraved and perverse for the public, and its deviance emerged like a shriek from the moral vacuum of World War I. A beleaguered Shostakovich, long subjected to brutal bullying by the government under the Stalin regime, kept his sardonic Violin Concerto No. 1 hidden for years. When he finally felt it was safe to share it with the public, he deliberately printed its early composition date—a wordless reminder to all of the political atmosphere that had choked its creation. Conductor Jakub Hrůša, the SF Symphony, and violinist Karen Gomyo join forces for this powerful and creatively defiant program. Off-The-Podium: a post-concert Q & A opportunity for the audience to ask questions of Jakub Hrůša & Karen Gomyo.